One of the challenges I'm having is getting materials to build my boat with. I live in Geraldton, Western Australia (not to be confused with the other WA). It's about 450km north of Perth, the capital of WA. I rather like bronze, but none of the local metal merchants stock it, none of the Australian mobs I've found are interested in small quantities, so that leaves American online mobs. I bought a piece of C220 bronze sheet from McMaster Carr recently to make bits from. So far I've used some to make plates to support the becket on my centerboard uphaul, and the cover plate featured in my last post on the front thwart. 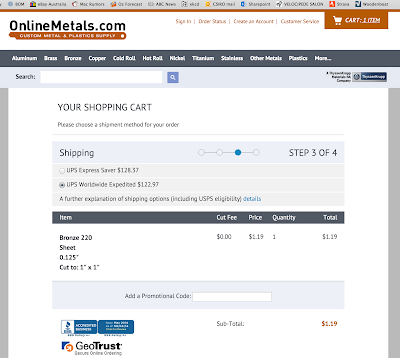 McMaster advertised a 2" x 24" x 0.09" piece of bronze for US$41.27. Expensive, but them's the brakes. I ordered it, and it showed up a week or so later. The cost on my card: AU$106.72. So the shipping was just as expensive as the metal. Yup, US$123 to ship a poxy couple of grams of bronze. Bastards. maybe http://www.metallundmehr24.de/ sends to Australia. New Apple based MythTV machine for home.